SINGAPORE - Companies and sectors grappling with cyclical downturns or industry shifts will receive more near-term help from the Government. Some of the measures are targeted rather than broad-based given the economy's uneven performance with some industries doing better than others, Finance Minister Heng Swee Keat noted in his Budget speech in Parliament on Monday (Feb 20). 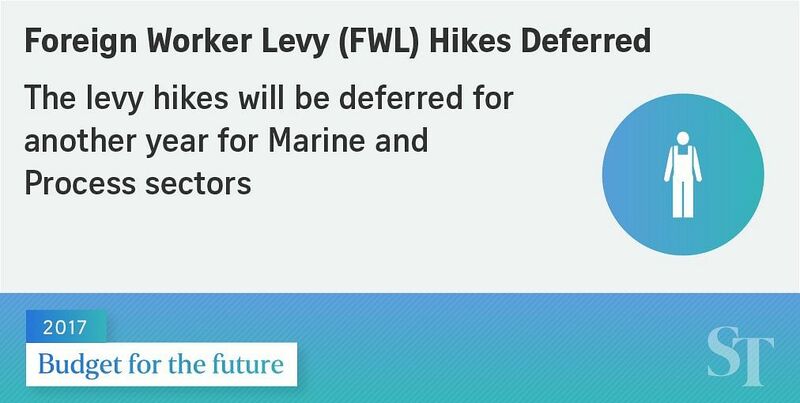 Notably, foreign worker levy increases for the hard-hit marine and process sectors will be deferred for one more year from July 1 this year to June 30, 2018. The process sector includes companies manufacturing petroleum, petrochemicals, speciality chemicals and pharmaceutical products. Work permit levies for the manufacturing sector will also remain unchanged, as will levy rates for more skilled S Pass holders across all industries. To support the construction sector in particular, some $700 million in public sector infrastructure projects will be brought forward in the next two years. Construction firms can bid for these projects, which will include the upgrading of community clubs and sports facilities. However, the Government will proceed with the planned levy increases for construction firms, so as to keep pushing for productivity improvement, said Mr Heng. From July 1 this year to June 30, 2019, the levy rates for Basic tier R2 workers will be raised from $650 now to $700. One key broad-based measure: The cap for the corporate income tax rebate will be raised from $20,000 to $25,000 for Year of Assessment (YA) 2017. The rebate itself will remain at 50 per cent of tax payable, after being hiked from 30 per cent last year. The rebate has also been extended one more year to YA2018, but at a lower rate of 20 per cent of tax payable. The enhanced, extended corporate tax rebate will cost the Government $310 million over the next two years. To help firms hiring older workers and encourage them to do so, the Government will extend the Additional Special Employment Credit (ASEC) to end-2019. Under the ASEC, employers get additional wage offsets of up to 3 per cent for hiring workers who are older then the current re-employment age of 65 and who earn up to $4,000 a month. This group will not be covered by the new re-employment age of 67, which takes effect on July 1 this year. The move will benefit about 120,000 workers and 55,000 employers at a cost of about $160 million. Mr Heng said firms will continue to receive near-term support from the continuation of existing schemes like the Special Employment Credit (SEC), Wage Credit Scheme and SME Working Capital Loan. The ASEC is on top of the SEC, introduced in 2011, which gives employers wage offset for workers aged 55 and above who earn up to $4,000 a month. The SEC, which also covers employees with disabilities, will benefit about 370,000 workers this year and cost about $300 million, said the minister. Under the Wage Credit Scheme, aimed at give firms more time to adjust to rising wages in a tight labour market, the Government co-funds 20 per cent of the wage increases given to Singaporean workers earning a gross monthly wage of $4,000 and below. Under the SME Working Capital Loan, extended for another two years, the Government co-shares 50 per cent of the default risk of loans up to $300,000 per SME to encourage banks to lend to them. To help workers who find themselves unemployed because their industry faces severe structural challenges, for example the retail sector, the Government announced a new scheme to help them find jobs in new growth sectors or learn. Called "Attach and Train", such workers will get training or internships in sectors that have good prospects but where companies may not be ready to hire yet. The scheme will boost the chances of these workers finding jobs in these sectors later, said Mr Heng. There is currently a Place & Train programme, but workers have to be employed by the company before they receive training. The Government will also raise wage and training support under existing measures like the Career Support Programme, the Professional Conversion Programme and the Work Trial Programme. It is committing up to $26 million more to expand its support for worker training. In all, firms will receive $1.4 billion of Government help in the year ahead from the additional measures, along with the extension of existing support schemes, said Mr Heng.